When you’re deciding on your place settings you want to pay attention to detail, but not use up your whole budget! Some simple ideas and affordable items can help you have a memorable and economical wedding. Here are some decoration ideas to help you pick the right items for you place settings. Choosing flatware is an important step. You can explore different cheap flatware options before making a choice. Stainless steel flatware is one of the simplest yet elegant options. Setting the tables with stainless steel flatware having modern mirror finish is a great idea. This dishwasher-safe flatware are durable easy to maintain. You can go for pearl studded flatware if you want a classier option. They come with stainless steel construction and lasting pearl studded ivory handles. You can choose silver flatware for a luxurious feel. Available in a vast variety of designs, this flatware is for those who appreciate beauty and tradition. This timeless flatware option reflects artistry from the past which continues to complement today’s tables. You can use flowers in different ways. You can use them to decorate the tables, doors, chairs etc. Go for pink rose and calla lily bouquets to decorate the centre of tables. You can choose a see through vase to show off the white Calla lilies entwined with long stems. The luxurious lavender roses and passionate pink roses can give the place a really inviting look. If you don’t want to go for this regular style of using flowers then here is another option for you. 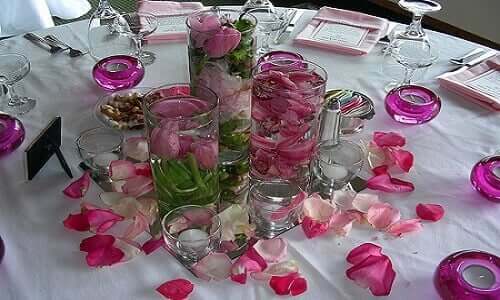 Pick some transparent cylindrical vases, fill them half with water and immerse the flowers or petals in it. You must fill the vases with water fully. This gives a unique look to the tables. You can simply pick some wide ribbons and cut them according to the width of the chairs. Now tie them around the chairs making a beautiful knot. If you don’t want the knot to be visible, you can paste or staple big artificial flowers on the knot. This will hide them, giving the chairs a nicer look. Be creative and think outside the box when you plan how to set the tables at you wedding. There are plenty of other things that you will surely need to spend you money on. So keep it simple and sweet. Congrats!